I haven't touched my fly gear in about two months. My fly tying station continues to sit empty with tools hidden away, feathers in bags, and hooks neatly organized until the news comes when I can start pursing my game again. I recently evacuated from my home in Yuba City after news got out about the Oroville Dam's emergency spillway possible failure. Tallest dam in the nation + possible failure = the 100 year flood. It sounds like a pretty cool premise for a movie but living it would definitely be something else. Thankfully the dam itself is fine it's the emergency spillway that is damaged. 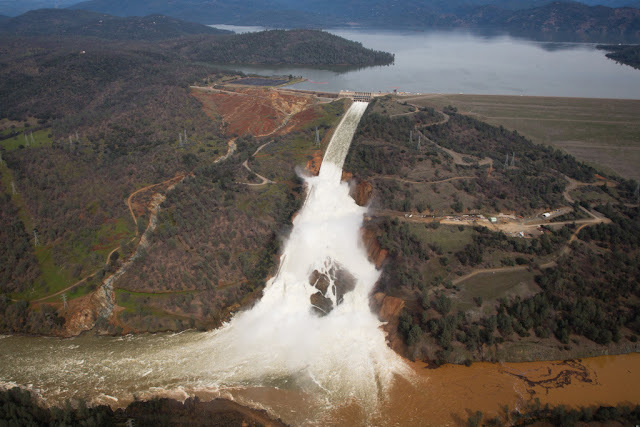 A broken emergency spillway would mean any water over the dam's height would flow uncontrollably out of Lake Oroville. This would lead to disastrous levels of flooding in Butte, Sutter, and Yuba County. The perfect storm. This could have been prevented if... Is the buzz around the situation right now. Apparently there are a lot of captain hindsights playing the blame game on social media. Fueled by the media's question of "What could you have done to prevent this?" these heroes make the world a little better through their powers of hindsight. Frankly I'm just happy to be home. Am I stress about the situation? Not really. I am more upset that I can't go fishing. Just as the Yuba was coming down this happens. The release of the Yuba is currently below 20,000 CFS but in Marysville it looks like 90,000 CFS due to increased flows from the Feather. Hopefully the levees hold up and we can end this saga without a repeat of 1997s levee break. It seems like the local stream fishing will be out of the question until the summer. We've still got a few more weeks until the bass wake up but at least I've got that to look forward to. I have everything packed in case the worst happens but as of right now it's just the same old same old. Times like these make me wonder what the Feather River and it's forks looked like before the Oroville dam was constructed. All I know is that the fishing must have been amazing. Imagine fishing for wild salmon and steelhead on the North Fork and Middle Fork. Those must have been the days.